Just the name alone sold me… Honey Soaked Apples? YUM!! I love fresh apple scents all year long so this was definitely a scent I wanted to experience, especially now that Fall is officially here. Pure, Crisp and Refreshing. A mild honey note with a pure crisp apple body for a high throw. First impression when smelling the wax? This scent was all apple and it was very fresh indeed. The honey was mild, I could barely smell it actually which the description indicates so – so far, so good. I must point out… this fragrance had wood chip embellishments in it so the first thing I did was pick them out one by one. Even though embellishments can be pretty and visually fun, I’m not a fan. Mostly because it’s messy and a pain to clean out of your melters. Once that was out of the way, I threw one cube (2 cubes total) in two electric melters in my great room. Five minutes later and I seriously mean five minutes… the fragrance of fresh apples and honey was everywhere and it smelled WONDERFUL! 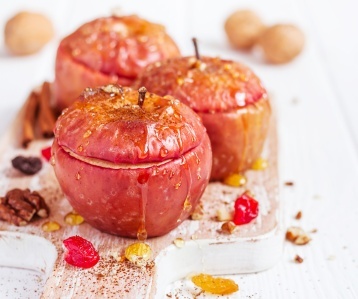 The apple wasn’t a tart kind of apple but more crisp, sweet and fresh, like biting into a ripe and sweet red apple. I loved it. The honey notes were there as well but very subtle. It smelled very sweet, like sugar. I also smelled a teeny hint of something spicy as well. Cinnamon maybe? I’m not sure but whatever it was… loved it! Strength – I would rate this scent a 10 out of 10 in any size room. Definite room filler. LOVED! Closing it up, I seriously loved Honey Soaked Apples and will for sure purchase again, and again, and again. 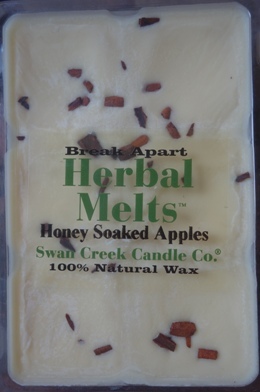 If you love Fall apple scent, Honey Soaked Apples is a must try. I may even try a candle next time. Visit Cape Candle – a retailer of Swan Creek that has great prices!